black people is an utter denial. This is the history of Western civilization. It has been somewhat difficult to figure out how to feel about the positions Johnson takes in his important piece—positions that I can gather many people have and perhaps do not speak openly about, and positions I respect. The difficulty is partly because we are both Black people in academia (I am a mixed-Black woman of African American and immigrant Korean heritage), and for me our Blackness matters in the sense that these ambiguously overlapping histories make a feeling in my speech and in my mind—something of a contradiction perhaps to what the author is asking for. He in fact asks the reader not to pivot on certain ethnically motivated political affiliations (for the purposes of sustained social change) lest we lose our class-conscious focus, and yet I find myself thinking about Black study (a condition of possibility, see Alexander Weheliye’s Habeas Viscus, 2014) as I write and respond here, specifically about the ways Blackness is constructed in the arguments presented and how that matters. Wherever the differences in approach lay, I believe we need Johnson’s perspective just as much as we need loving resistance to it. To address some of the author’s concerns I offer the following. Operationally, race is “an ongoing set of political relations that require, through constant perpetuation via institutions, discourses, practices, desires, infrastructures, languages, technologies, sciences, economies, dreams, and cultural artifacts, the barring of non-white subjects from the category of the human as it is performed in the modern west.”3 This system produces racism as defined by Ruth Wilson Gilmore (Golden Gulag, 2006) as premature vulnerability to state-sanctioned violence, functioning on different scales simultaneously—body, city, state, memory, and territory—and justified by race-based common sense. Thus, race as an assemblage (where race, location, and time together inform what it means to be human, see Katherine McKittrick, Sylvia Wynter on Being Human as Praxis, 2015) produces certain expressions of “Black ethnic politics,” and though these expressions might represent a complex and evolving Pandora’s box, we know for certain that Black identification processes far predate the Black Lives Matter (BLM) movement, and that they exist as a source of survival and support against a violent modern humanity committed to a “race” system (which of course, includes white people). What I suggest with these ideas is that a truly “interracial” landscape of working-class solidarity with white people is most deeply possible through and with Black study, with a naked focus on race. If we thought about race in the manner of Sylvia Wynter, McKittrick, and Weheliye, there would be no way to circumvent capitalism, genocide, and immigrant and migrant dispossession. There would be no way to exclude white people. This would address our need for a more syncretic narrative of practical history, one which is found for example in the work of Lisa Lowe (The Intimacies of Four Continents, 2015), where she “investigates the often obscured connections between the emergence of European liberalism, settler colonialism in the Americas, the transatlantic slave trade, and the east Indies and China trades in the late eighteenth and nineteenth centuries.” In a similar effort, Ciccariello-Maher explores the need for a radical dialectical politics, writing that “for those relegated to nonbeing and condemned to invisibility, to even appear is a violent act—because it is violent to the structures of the world and because it will inevitably be treated as such.”4 Thus, these scholars suggest that concrete resistance requires we avoid “ontological apartheid” (the impulse to rank and make commensurate our histories and emplaced experiences). Intimacy would require that we deny the divisibility of class from race and gender (where one must become the standpoint through which the others are subsumed), in order to engage in a dialectical tension that keeps our solidarities stretching and unfinished. Johnson develops a critique that the Black Panther Party movement (BPPM) failed to marshal broad-based support on the level of the New Deal, as an example of a universal program purported to have helped everyone. Yet the New Deal is widely critiqued for failing Black people,5 specifically because most New Deal programs discriminated against Blacks, authorized separate and lower pay scales for Blacks, refused outright to support Black applicants (for example the Federal Housing Authority refused to guarantee mortgages for Blacks who tried to buy in white neighborhoods), and the Civilian Conservation Corps maintained segregated camps. The Social Security Act excluded those job categories Blacks traditionally filled (domestic work), and the Agricultural Adjustment Administration policies forced more than 100,000 Blacks off the land in 1933 and 1934. At the same time there was widespread working-class nonsupport for an anti-lynching bill and a bill to abolish the poll tax. the ways in which the BPP struggled for social reproduction through their breakfast program in their Black communities, and how it allowed them to organize chapters across the United States, and then produce an internationally recognized moment of revolutionary potential, exhibits how individual actors transform and reproduce the material foundations of life in scaled ways, and transform the geographies of survival. Finally on this point we might also ask ourselves whether in public life we could ever make similar political demands of indigenous North Americans or any indigenous group without risking real incredulity from even the most cynical Fox News pundit. It likely surprises no one for instance, to hear that indigenous tribes living in the Amazon rainforest are protesting (on the basis of eco-genocide) Brazilian President-elect Jair Bolsonaro’s public commitments to state-sponsored violence and neocolonial dispossession. On what basis could we suggest that their problems lay in their militancy (as Johnson suggests with regard to BPPM and BLM)? In the North American indigenous context, we know that “Indians” were often consolidated onto multi-tribe “reservation” enclosures, speaking different languages and having distinct geographical and cultural ways-of-knowing, and yet despite these diversities and diasporas, nonindigenous audiences witness a simultaneous, ongoing demand that indigenous cosmologies, treaties, and lives be reckoned with. But one thing is sure and that is the fact that since the fifteenth century these ancestors of mine and their other descendants have had a common history, have suffered a common disaster, and have one long memory. The actual ties of heritage between the individuals of this group vary with the ancestors that they have in common and many others: Europeans and Semites, perhaps Mongolians, certainly American Indians. But the physical bond is least and the badge of color relatively unimportant save as a badge; the real essence of this kinship is its social heritage of slavery, the discrimination and insult, and this heritage binds together not simply the children of Africa, but extends through yellow Asia and into the South Seas. It is this unity that draws me to Africa. Shelby uses this excerpt as a foundation for two related positions: 1) that Black political solidarity as understood through the common experience of racial oppression (one’s vulnerability to anti-Black racism) continues to be a valuable source of motivation and strength in the face of unrelenting vulnerabilities, death, alienation, despair, and self-doubt—and toward a vigor “necessary for both self-respect and collective self-defense,” and 2) a more robust solidarity must include a “specifically political mode of Blackness practiced through certain principles such as anti-racism, equal educational and employment opportunity, and tolerance for group differences and individuality, and to emancipatory goals, such as achieving substantive racial equality—especially in employment, education, and wealth—and ending ghetto poverty.” Interestingly, Shelby explicitly calls for Blacks to resist political centralization, for the very reasons Johnson points to, and says Black self-organization is important, should be voluntary, and should be rooted in particular communities of interest—a multi-sited public sphere focused on dialogue and participation. In this sense, while Black interests can be advanced through multiracial associations or within a multiracial polity, the well-being of Blacks always also requires—as a means to attend to accumulating, historical, unfair disadvantage—a collective sense of Black self-determination. Johnson critiques “the liberal decoupling of race and class that supplanted more radical versions of working-class left politics,” citing the BLM and the BPP movements as examples of why focusing on race is misguided and critiquing these movements for a lack of outcomes. We can agree that the decoupling is a problem, but it is a problem because race-class is an always-present (and often ignored) intersectional assemblage, present whether or not the guise is a focus on “class-consciousness.” The influence of these movements cannot be measured only in static outcomes (although there are in fact real outcomes, such as the federal free breakfast program and a deeper public tension and engagement with Black vulnerability to “premature death”; see Gilmore’s 2006 Golden Gulag). The benefits of universal programs such as the New Deal cannot be misremembered as materially transforming for the better the lives of the most marginalized Black Americans. Continued deep grappling with race and white supremacy by Black Americans can help us cultivate a Black political consciousness and solidarity from which to strengthen race-class articulations, whereas the pivot to support class political interests along party lines with the kind of power and influence Johnson seeks has not demonstrated to Black Americans the kinds of mutuality and support required in an ongoing, historically and cumulatively race-class reality. C.L.R. James, A History of Pan-African Revolt (Spear Press, Second Edition, Revised, 1969). Alexander G. Weheliye, Habeas Viscus: Racializing Assemblages, Biopolitics, and Black Feminist Theories of the Human (Duke University Press, 2014). George Ciccariello-Maher, Decolonizing Dialectics (Duke University Press, 2017). 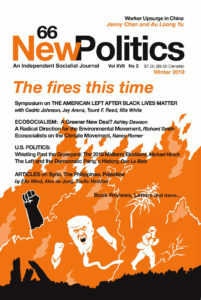 Adolph Reed, “Race and the Disruption of the New Deal Coalition,” Urban Affairs Quarterly (Vol. 27, No. 2, 1991), 326–333; Eric Rauchway, The Great Depression and the New Deal: a Very Short Introduction (Oxford University Press, 2008). For an example of the dominant scholarship, see Brady Thomas Heiner, “Foucault and the Black Panthers,” City (Vol. 11, No. 3, 2007), 313–356. Nik Heynen, “Bending the Bars of Empire from Every Ghetto for Survival: The Black Panther Party’s Radical Anti-hunger Politics of Social Reproduction and Scale,” Annals of the Association of American Geographers (Vol. 99, No. 2, 2009), 406–422. Alondra Nelson, Body and Soul: the Black Panther Party and the Fight Against Medical Discrimination (University of Minnesota Press, 2013). Alana Lentin, “Thinking blackly: Beyond biopolitics and bare life,” Mar. 22, 2017.